Living With a Corn Allergy Mama Say What?! | Mama Say What?! When you hear of a friend’s child having ‘food allergies,’ you probably think peanuts or eggs. Those allergies are certainly frustrating, (I know, because my son is allergic to both of those things, among others), but the kicker for us is corn. You’d think corn would be easy to cut out of your diet, right? Throw away the microwave popcorn, cut out soda with ‘high fructose corn syrup,’ and you’re good to go. But that’s false. It’s astounding, once you learn, how corn has inundated our everyday diets. Whenever we go out of the house, I bring a safe meal for L, just in case. When we eat at friends’ houses, L has to have his own safe food. Birthday parties are particularly difficult for a toddler who can’t eat one bite of the cake or any of the snacks served. I’m always scared to leave him in a preschool class or daycare, even at church or our gym childcare for an hour. It’s so, so hard. Luckily for us, my son is considered “corn-lite,” which means he can eat some things that have traces of corn and he likely won’t have a reaction. When he does react, he gets hives and diarrhea. But his biggest reaction is behavioral. He gets very angry, completely inconsolable. He totally melts down over literally nothing. Take your normal 2 year old tantrum, and multiply it by a hundred and make it last for about 48 hours— this is my son on corn. For the most part, these reactions are just exhausting. They have not yet become physically dangerous for him, though they could at any moment. For many people with this allergy, life can feel impossible. I’d be tempted to say that 90% of supermarket products contain corn. I’m not sure if that’s accurate, but it’s sure close. I bet you’ll be shocked at where corn is hidden. Meat. First, let’s talk fowl. That turkey you ate on Thanksgiving? He was fed corn all year long. But what about a steak? Well, even if the cow wasn’t fed corn, most meats are washed with lactic acid or citric acid before processing. Do you know what lactic acid and citric acid are derived from? You guessed it… corn. Fresh fish and canned fish are frozen in a slurry that contains corn. Almost all the spices and extracts in your cabinet contain corn. Your bag of shredded cheese has corn starch in it as a preservative. Almonds are required by the FDA to be pasteurized. During the pasteurization process, they are treated with corn. The yogurt your toddler loves, and the sour cream you put on your tacos, many have corn starch in them as a thickener. Baking powder and powdered sugar get their consistency from corn. Your ketchup most likely contains corn syrup. 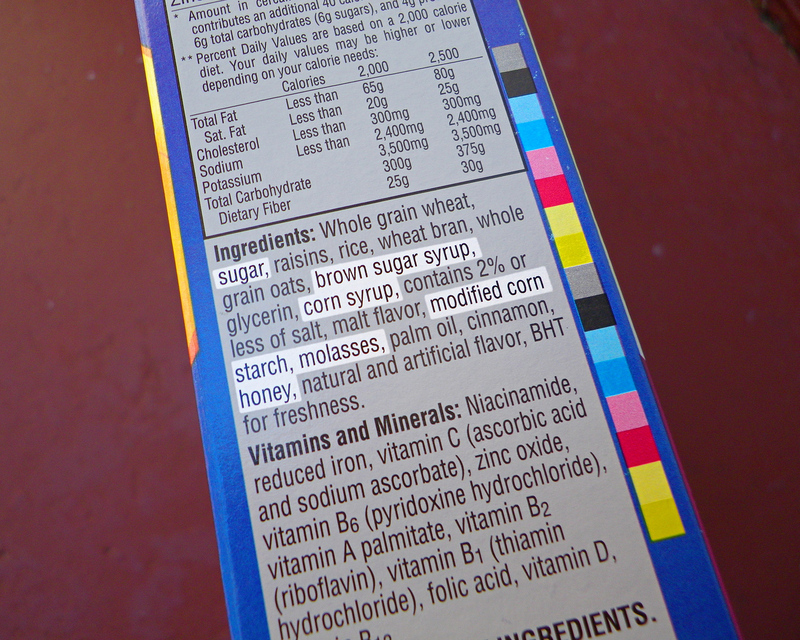 Iodized salt contains dextrose— which is one of those ‘hidden words’ for corn. (see below for a list of hidden words!) 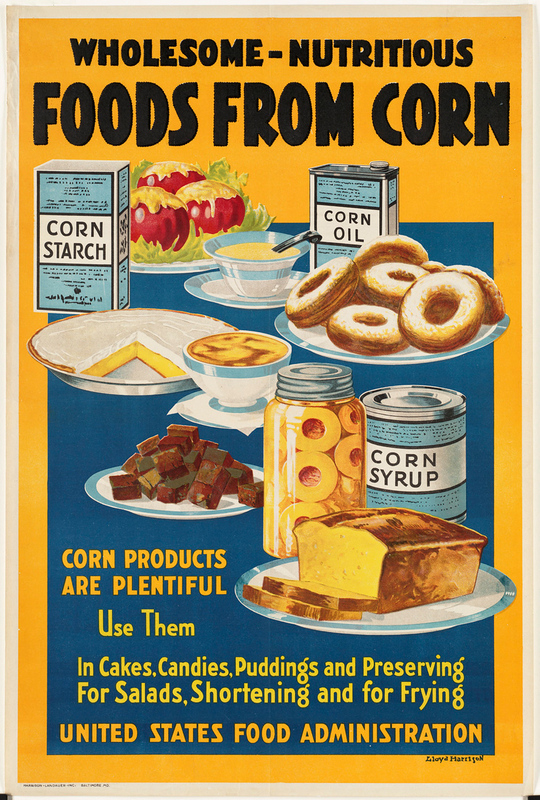 Canned fruit, canned vegetables, canned soup… anything canned really, pretty much all contain corn. 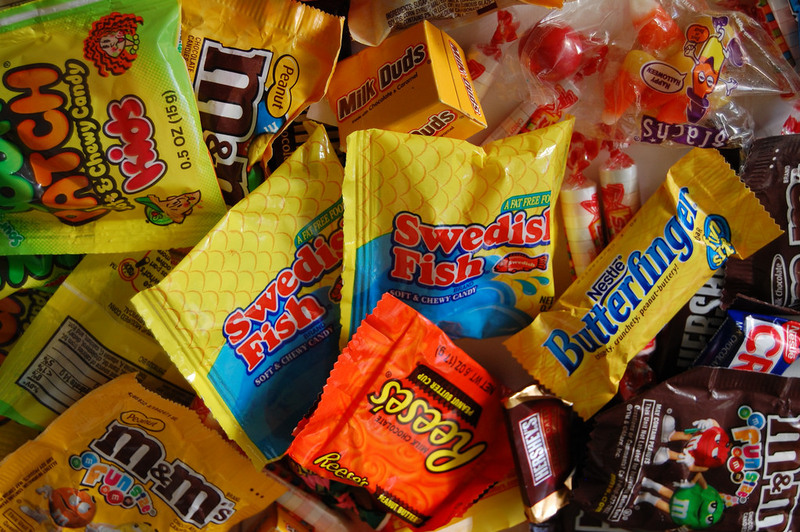 I’m be tempted to say that most candy contains corn- even chocolate. Marshmallows are made from corn syrup. Do you only eat fresh produce? Well, most veggies are treated with citric acid as an anti-bacterial. (That bag of baby carrots in your fridge is majorly corny!) Citric acid is usually derived from corn (though it can be derived from beets, too, but the FDA doesn’t require packaging to specify) Your fresh fruit might not be corn-free either; apples, oranges, lemons and other fruits are often coated in a corn-based wax. Fresh berries are packaged with a white or blue soaker pad— that soaker pad is made from corn. Even some bottled water isn’t safe. Most brands of bottled water use plant-based plastic for it’s bottles— and plant-based means corn. When my son needs medicine— anything really, Tylenol, Benedryl, Neosporin— we have to find a pharmacy willing to compound it individually for him. All these medicines contain corn syrup, or at the least, are processed on machinery that uses corn. Vitamins and supplements are made from corn or the capsule is coated in corn. If you happen to find a packaged item that doesn’t contain corn, check the packaging itself. Many packaging materials contain corn starch— and it isn’t even listed with the ingredients. Really, I could go on and on. 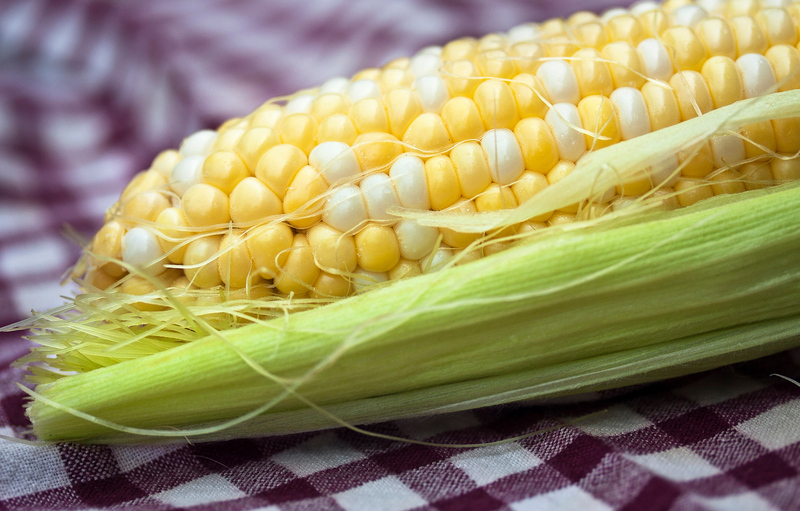 This blog post hardly touches on where corn appears in your every day diet. For most people, this is enlightening but not that big of a deal. For some, like my little boy and our family, it’s devastating news and can be overwhelming every single day. To end, here is a quick cheat sheet of where corn hides in ingredient lists. These are only the most common and is definitely not an all-inclusive list. I challenge you to check the ingredient lists of things you buy in the grocery next time you go shopping, and be aware of where corn is hiding. Not that you should switch it out, just simply be aware. and of course anything labeled corn— like corn starch, corn syrup, corn extract, corn alcohol, corn flour, corn sugar, and cornmeal. Bet you didn’t realize how much corn is in our lives, right? Added by Cassie W. on February 20, 2017. 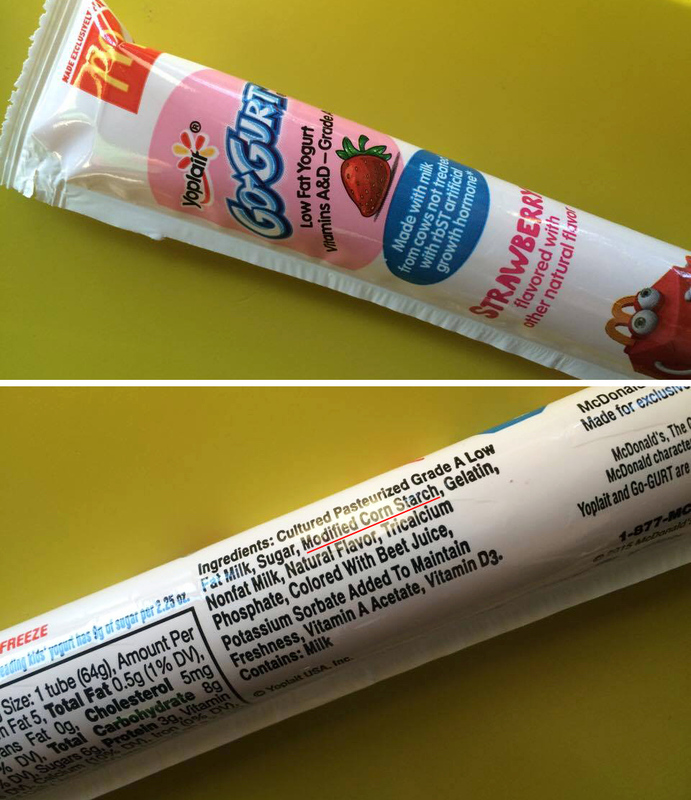 I had no idea how many ingredients could cause allergic reactions for kiddos. Thank you for sharing. Thank you for sharing. My mother is corn allergy.